This poster was hung on the door to the apartment building where Kenneth "Kiwi" Herring was shot during police investigation of reported stabbing. Two officers fatally shot Herring Aug. 23 as they investigated reports of a stabbing at Herring’s apartment building in the 5200 block of Ridge Avenue. At the second of two vigils following Herring’s death, speakers passionately urged people to remember and honor Herring and continue a long fight against transphobia in social institutions, workplaces and relationships. Advocates say Herring’s death highlights a history of violence perpetrated against people who are transgender, and particularly transgender people of color, as well as complex tensions between the community and police. Members of the LGBTQ community and advocates discuss violence faced by transgender people and the concern it inspires regarding police interactions. Concern over police interactions with people who are transgender is a national issue that Herring’s death brings home. Across the nation, 19 transgender people have been murdered so far this year and reports of violence have grown steadily in recent years, according to GLAAD, the LGBTQ advocacy group. In 2016, 27 transgender people were murdered. Transgender respondents to a 2015 national survey reported a significant level of harassment by police officers. More than half the survey participants said they were uncomfortable asking police for help. According to police reports, the officers who responded to Herring’s apartment fired their weapons at her after Herring swung a knife at one of them, cutting the officer on his arm. Herring’s death was part of a continuum of violence against people who did not receive adequate protection from police, writer Joss Barton said at the second vigil for Herring. “If the history of this country was adequately recorded, her name would be in a long list of trans women, trans folks, people of color, gender nonconforming people that have been killed and murdered by this state,” Barton said. Herring’s death highlights a question in the LGBTQ community: Should transgender people worry about interacting with police? Barton said Herring’s death came as a blow to the community but wasn’t a complete shock given the circumstances of her death. Police said they could not comment about the circumstances of Herring’s death as the case is still under investigation. But St. Louis Police Department’s LGBT liaisons, Lt. Alana Hauck said since January more than 1,000 officers have received training in how to interact with members of the LGBTQ community with sensitivity. Officers also have learned that members of the transgender community are upset when police mislabel transgender people with the wrong pronoun, she said. Hauk said that the department is aware of community concerns and wanted to stress that anyone calling to report a crime will be treated with “extreme compassion” regardless of their sexual orientation, gender, or identity. She said the department does not tolerate discrimination. The department does not plan to address community concerns following Herring’s death, Hauk said, but she encourages people with concerns to contact police. But Barton said Herring should never have died during the police encounter. “This really reinforces this narrative in America that if you’re a trans person especially a trans woman, then the state and the law and justice is really not on your side,” Barton said. 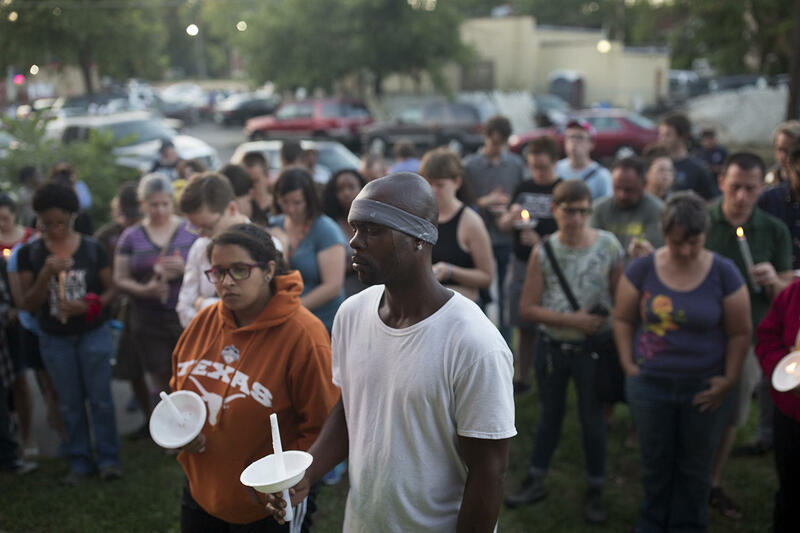 Mourners gather outside the building where Kenneth "Kiwi" Herring was shot on Aug. 23. 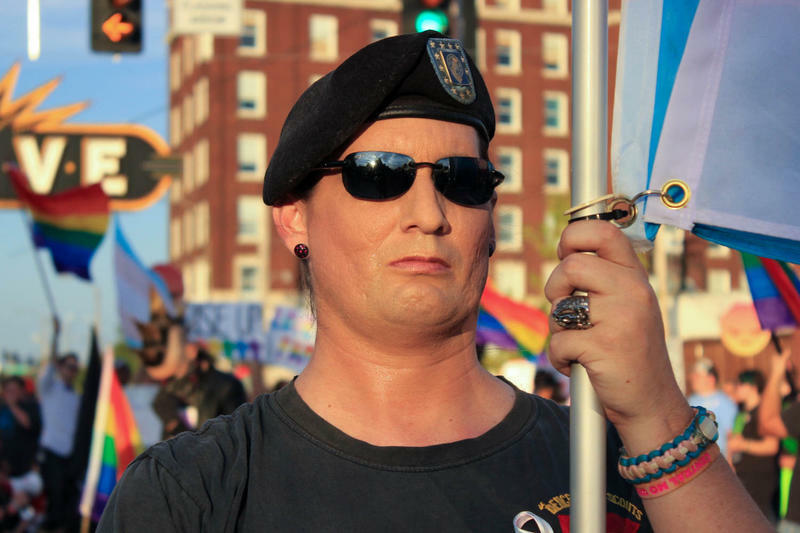 Even before Herring’s death, the statewide LGTBQ organization PROMO had received calls from around the state asking for advice and resources for interacting with law enforcement, Executive Director Steph Perkins said. Research and studies indicate transgender people of color — particularly transgender women of color — are at an increased level of risk in encounters with police. However, Perkins said some members of the community are concerned law enforcement won’t take their complaints seriously because officers distrust or don’t understand the LGBTQ community. Others — informed by their own experiences or the experiences of friends and family — worry about an increased likelihood of violence when police arrive. Stories of discrimination and violence are common in the transgender community, Perkins said. “People see this and are afraid to go to law enforcement, even in places where law enforcement are trained and willing and happy to help them and competent when it comes to LGBT communities,” Perkins said. People are scared, Perkins said, because almost everyone in the community has either experienced discrimination or violence directly or knows someone who has. For Barton, vigils and homegrown activism could provide a foundation for the broader public to better understand the violence transgender people of color experience. Nearly one month after indicating a change in military protocol with three tweets, President Donald Trump signed an official memo implementing a new policy on "military service for transgender individuals." The memo indicates a reversal of an Obama-era policy implemented in 2016, which allowed active-duty service members who are transgender to serve openly and transition while enlisted. Updated at 5:24 p.m. — Members of the LGBTQ community, activists and advocates are outraged that police shot and killed a transgender black woman this week. Frustrated by the shooting — and that police identified Kenneth “Kiwi” Herring as a man — about 40 people gathered outside the building in which Herring was shot Tuesday for a vigil and to express dissatisfaction with a police force they said was disrespectful and too quick to shoot.